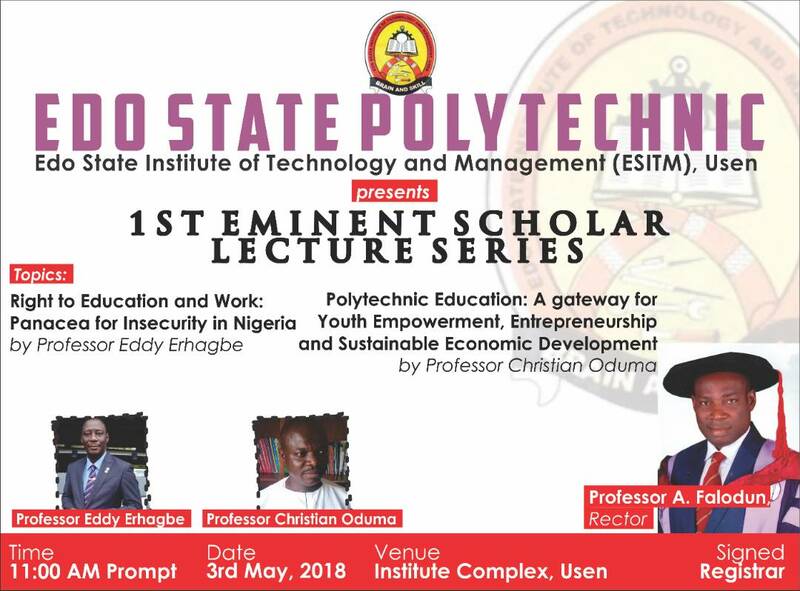 Students and scholars at the Edo State Institute of Technology and Management (ESTIM), Usen, Edo State, also known as Edo State Polytechnic, will on May 3 play host to Professors Eddy Erhagbe and Christian Oduma for the institute’s first Eminent Scholar Lecture Series. In a statement signed by ESTIM’s Registrar, Simire Cyril, the institute said that the lecture, will address topical issues in polytechnic education, security and economic development. The two topics for discussion are Right to Education and Work: Panacea for Insecurity in Nigeria by Professor Eddy Erhagbe; andPolytechnic Education: A gateway for Youth Empowerment, Entrepreneurship and Sustainable Economic Development by Professor Christain Oduma. The lecture which will hold at the institute, is one of the series of initiatives being pursued by the institution’s new Rector, Professor Abiodun Falodun.